Alcohol will be banned from summer solstice celebrations at Stonehenge this June – and there will also be a £15 fee to park at the stones. English Heritage say the new rules will encourage more people to car share or use public transport. Forty thousand people attended two years ago and the stones were vandalised. Money raised will go towards maintenance. 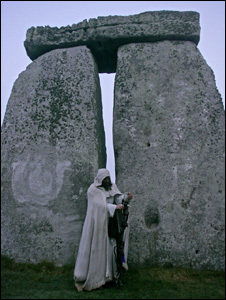 Four years ago (time, even immemorial, flies) I was working on an exhibition about Stonehenge for English Heritage, and I wrote a blog about a frequently reproduced photo of the stones. The image shows a crowd of people, bicycles and carts and horses, and had been commonly said to show a protest in 1901 against an admission charge. In fact the photo was taken in 1896 (along with at least one similar shot), on the occasion of a visit from a travelling musical troupe called the Magpie Musicians.